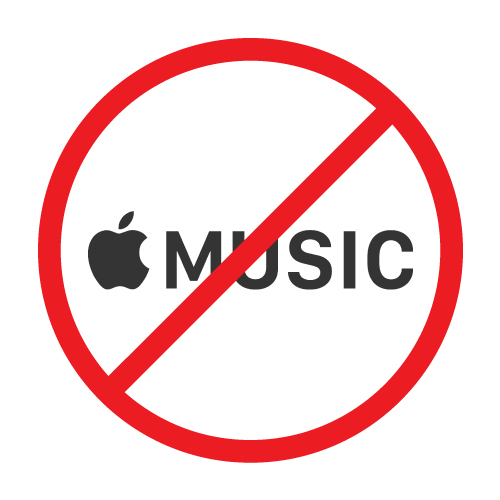 Apple has finally realized that audiobooks aren't music. This morning, I wanted to continue listening to my audiobook of "The Book Thief" but I couldn't seem to figure out how to access it with the new Apple Music app. I finally found it hidden in plain sight—in the iBooks app where it rightfully belongs. But even though this change has me praising Apple, I have found more cons than pros when it comes to the new Apple Music app. But let's start with the pros. The iTunes app logo! Beautiful colors! For You - pretty cool! Some cool Playlists, sorted by producer (Behind the Boards), sounds like, etc. While the free trial period is 3 months long (longer than most free trials), the service doesn't appear to be worth the money. This service is supposed to let you listen to all music sold on iTunes, but I've found that a lot of albums I want to listen to have half the songs greyed out! And there have also been some albums that I am unable to find on Apple Music that ARE on iTunes! For the single membership cost of $9.99/month, I think I'd rather go with Spotify Premium which is the same price! When I click the plus sign to add songs or albums to My Music, it removes what I've added within seconds. When connected to my car with a USB cable or with bluetooth, albums just keep playing the same song rather than playing the next song. (This is because up next is apparently not compatible with my car.) BACKWARDS COMPATIBILITY. 3. Too many apps - iTunes, Apple Music, iTunes Store, App Store...you get the picture! You'd think this feature would be seamless, especially since Apple is constantly improving it for other apps (example: Messages, Continuity, etc.) but it definitely is NOT. None of the music that I've added to "My Music" on iTunes on my mac has shown in My Music on my iPhone. Disclaimer: If you've found a solution to any of these problems, please let me know. Everything listed above is just the opinion of a disappointed Apple fan. A better way to search for music videos - there is a wealth of videos, but they're hard to find if you don't know the name of the song! This entry was posted on Jul 7, 2015 and is filed under Apple , Design , iOS , Life , OSX , Reviews . You can follow any responses to this entry through the RSS 2.0 . You can leave a response .